Overview: Following an accidental teleportation from Mars, J’onn J’onzz finds himself stranded on Earth. Making the most of his situation, J’onzz develops a human identity, Detective John Jones, to assist the local police department in rounding up criminals. Along the way, supporting characters like Captain Harding and Diane Meade are introduced to provide a cast to expand the stories. During this era, the Martian Manhunter’s powers and abilities would change, depending upon the needs of the story. Among his many powers were superhuman strength; superhuman speed; superhuman senses; a genius-level intellect; superhuman endurance; shapeshifting; invulnerability; vortex breath, invisibility; tactile telekinesis; intangibility; flight; telepathy; and Martian vision. Like Superman and kryptonite or Green Lantern with the color yellow, the Martian Manhunter has a weakness to fire in any form, from the light of a match to one of the numerous fireworks factories in his city. Also included in this volume is a story from Batman #78, which has a “Manhunter from Mars” landing in Gotham City, and enlisting Batman’s help to capture a rogue Martian. Maybe this served as the inspiration for the character that would be introduced two years later, or maybe it was just a true coincidence. Why should these stories be Showcased? : The Martian Manhunter is a historically important character. He debuted at the tail end of the Golden Age, and has remained a part of the DC Universe ever since. These stories follow a basic formula of Det. Jones receiving an assignment; he uses his powers to track down the bad guy; and overcomes some random appearance of fire to bring the story to conclusion, all in six pages. There is not a log of imaginative stories in this volume. The more entertaining stories involving J’onn J’onzz come much later, beginning with the Justice League series in the mid-1980s. Footnotes: Despite this volume covering seven full years of stories from Detective Comics, the Martian Manhunter does not appear on any covers during this run. His first cover appearance is The Brave and the Bold #28, which was the first appearance of the Justice League of America. 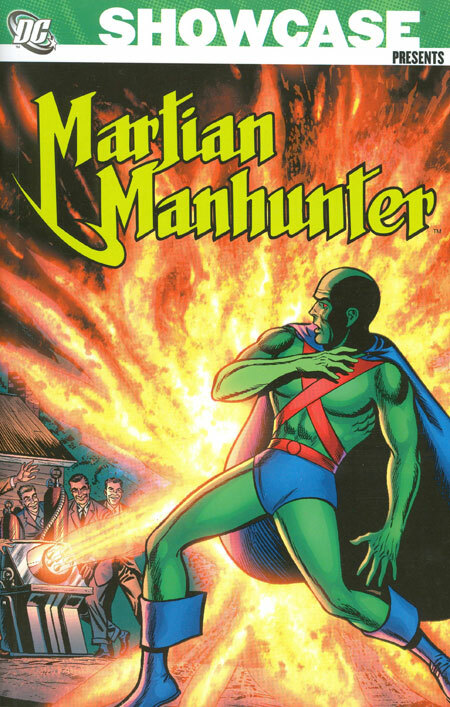 In the early days of the JLA, the Martian Manhunter served as the Superman substitute (and Green Arrow served as the Batman substitute) to avoid overexposure of DC’s main characters. If you like this volume, try: the Martian Manhunter series from 1998, written by John Ostrander. Sadly, no trades of this have been collected, but individual issues can be found in quarter bins everywhere. Given the success of Grant Morrison’s JLA book, this series launched during the DC 1,000,000 event, so there is a #0 issue and a #1000000 issue before issue #1 was released. The series ran until #36, before succumbing to declining sales. One story arc to look for in particular is the Revelations story from issues #20 to #24. This retold key events in J’onn J’onzz’s (revised) history, from coming to Earth to his first encounters with Green Lantern and Batman. The story arc is capped off with the memorable Oreo issue during the JLI years. This entry was posted in DC Showcase Presents, Martian Manhunter and tagged Jack Miller, Joe Certa, Martian Manhunter. Bookmark the permalink.